Common questions and answers about orthodontics. You’ve probably heard a lot of rumors about what you can’t eat when you have braces. With the braces we use, we typically tell patients that most food is still allowed—it’s just that it should be eaten a little differently. For example, apples are great! But when wearing braces it’s probably best to eat a sliced apple instead of trying to bite into the whole thing. Very hard foods like hard candies should probably be avoided, not just because they will cause breakage but also because candy has sugar which we all know is not great for teeth. When braces are first placed your teeth will feel a little different to your tongue and your cheeks. This is normal and as your mouth gets more used to things your braces will start to feel more and more normal. This adjustment period usually takes between 3 days and a week. Will I need to wear rubber bands? Rubber bands are used by orthodontists to help top and bottom teeth fit together in the best way. Although not all patient will be asked by an orthodontist to wear rubber bands, some are. If you are asked by Dr. Berkman or Dr. Shapiro to wear rubber bands with your braces, it’s important that they be worn as prescribed. With most orthodontic patients, the more rubber bands are worn consistently, the less time the braces will be on overall. This is one of the things that, with braces, gives patients the most control with how soon braces come off! Do I need to brush and floss more? Braces do not cause more cavities. But they do make it a bit more difficult for your cheeks and tongue to naturally keep your teeth clean. And it makes brushing a bit more of a challenge. Therefore, it’s very important that you take brushing and flossing seriously during your orthodontic treatment. 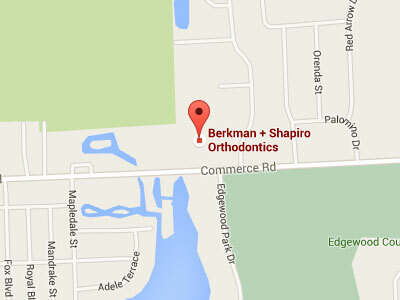 Dr. Berkman and Shapiro recommend that all patients with braces brush in the morning, after every meal, and before bed.